Diamonds for Dessert: Glee Cookies! 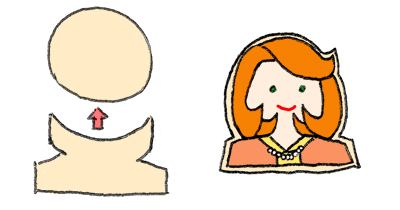 For all the characters, except Sue (she was more square), I started with a circle for the face, and made additional additions with little bits of dough for the hair and ears. 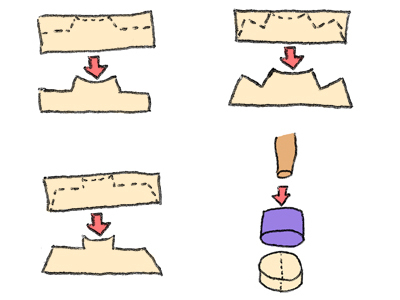 Then I used a knife to alter a rectangle for the neck/body. 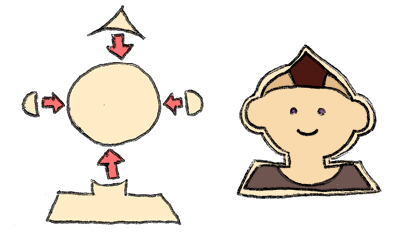 The ears were made as usual, by cutting out circles with a pearl milk tea straw, pushing the circles out with a chopstick, and then cutting the dough circle in half. 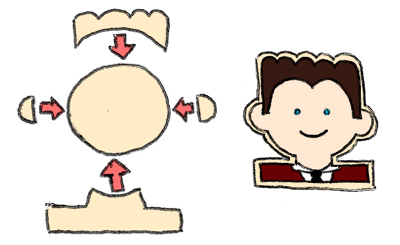 Below, on the left side of the pictures, I've illustrated how I generally made each of the character cookie dough shapes. The numbered steps above the pictures are the order in which I iced and decorated each character after the cookies were baked and cooled. 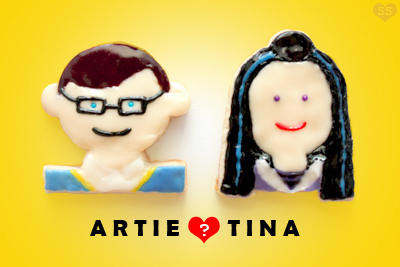 The right side of the character image shows how the cookies look after all the icing is done. Mix food coloring with the sugar cookie icing and use toothpicks to spread the icing onto the cookies. Let the icing dry between steps. WHOA!! awesome! you've got time! Susan, you are killing me. These are effing adorable. BTW, I booked my tickets to Paris! :) Send me that list anytime + any advice you have on Parisian tourism. I hear I need to be careful of pickpockets, especially around the effiel tower. tiffany: apparently I do, haha. season starts Tuesday (tonight) at 9/8c. Chocolatte: Thank you. Yay, Paris! I totally want to go back. I'll definitely get you that list of places to visit + random advice before you go. Don't watch, but the cookies are fabulous! 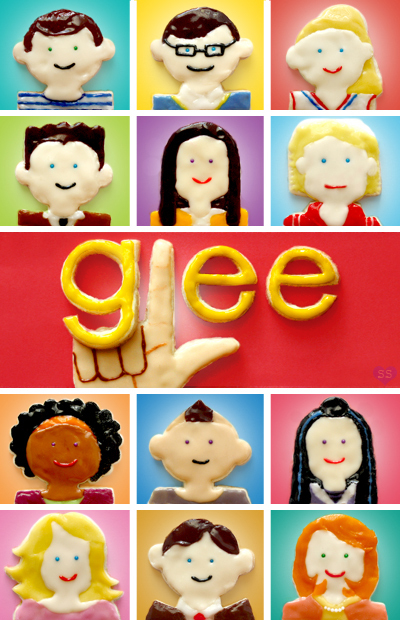 My 35 yr old daughter ADORES Glee..These are so adorable..the show should see them!! 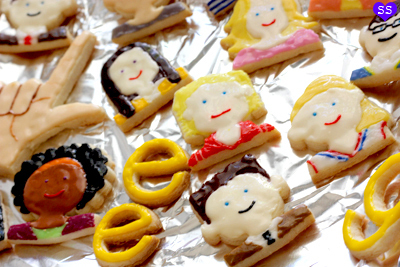 Those Glee cookies look amazing - it's making me that much more excited for the new season! Brilliant! I had to post a link (ediblecrafts.craftgossip.com). Did I say brilliant yet? You're cookies are too cute to be true!!! These cookies are absolutely adorable! Great job. Sue, La Table De Nana, Chic Cookies, AlvianaKalin, ellesaysopa: Thank you! Chocolate Shavings: Less than 24 hours till the new season, hehe. Debora: Thanks. Feel free to mention this post as long as you credit me and post a link back to my blog. thanks to tastespotting sight I found my way to your wonderful blog. OMG to the nth degree!!!! You are out of this world creative???? 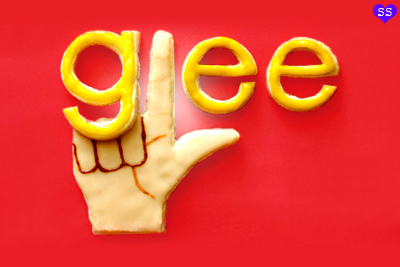 Glee+ cookies= LUV!!!!! these are so cute! must have taken quite a bit of time to make. great work! i'm excited for glee tonight! these are absolutely amazing! my favorite is Emma -- you got her down to the T! I was going to do some glee-themed baking too, but I think I'm going just going to pick up a big gulp from 7-11 instead hah! 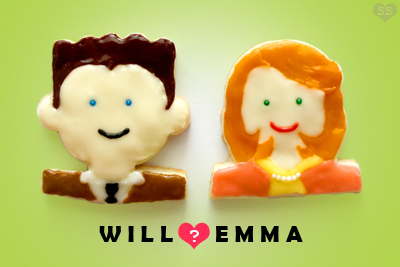 Oh my gosh, those are so cute, and the perfect thing for me to see just before watching the season premier! REALLY impressive and amazingly well done. the only thing better than glee starting tonite (in 10 minutes) would be glee starting tonite and me with one of those cookies in my mouth!!! Anonymous: Brittany and Santana are indeed hilarious together. Peggy: Thank you! Yes! Glee & Cookies, two things I love very much. Annie: The cookie baking was quick. The decorating wasn't as time consuming as I anticipated since I only made one of each character. I just ended up adding more and more details the longer I decorated, haha. Joie de vivre: Thanks :D. Puck is too cool. CupcakesOMG!, Rebecca, Susan Crabtree, staci, & shelley c: Haha, thank you. Donna: Emma is so cute, I love the clothes she wears. I think I spent more time on her just because I wanted to capture the neatness of her clothing. Thanks! Cindy: Thank you. I'm guessing you're on the East Coast? I have to wait a couple more hours here in CA. Oh my god, I love these! Can't wait to watch Glee tonight! So clever! Awesome! Love these! So impressive! Thanks for the BIG, big smile! These are too funny. I may have to copy you for an upcoming girl's TV night! Anonymous: Awesome coincidence. Hehe, definitely try them out. Nhi: Thank you. I watched the episode and totally thought of your comment. Sad, but I get the feeling that as we get deeper into the season even more couple changes will be needed, dunno if that's a good or bad thing? 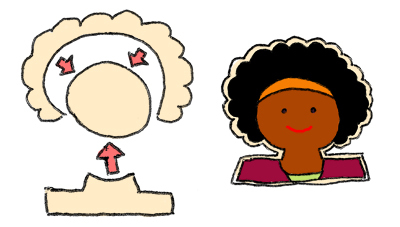 Cathy, Amanda Ann, claire, Tina, Stef, & Nina Ryan: Thanks for the nice comments! A SPICY PERSPECTIVE: Haha, you're welcome. I hope you do try them out! They're quite fun to decorate. Ohmygosh those are soo amazingly awesome!!!!! 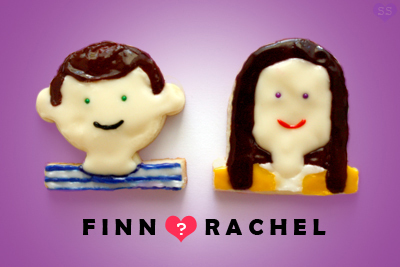 Pretty much the coolest cookies (and show!) ever!!! cloridaaa & Kimme Rae: Thank you! That is fantastic, I don't even watch the show! How very cute... great job! Tif, justJENN, Sarah, Anonymous 2: Thanks! Anonymous 1: Thanks so much for letting me know about the two links! So cool. 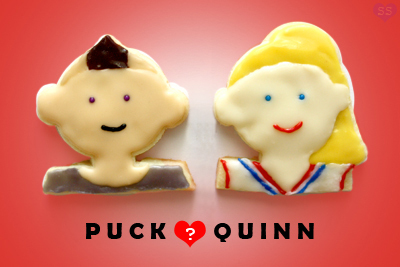 And Quinn could easily be Brittany, I guess a different expression would set them apart. 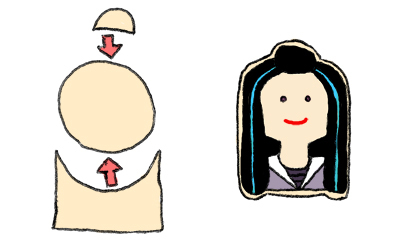 Make the hair black and darken the "skin" and you have Santana. This is really fabulous! You are really so creative. Stopping by from WWEPW. Your cookies are fabulous...too pretty to eat. ;) Great job! WOOOOOOOOOWWWWWWWWWW!!!!! They are great!! and you are so good at doing them! too much work I guess..... to be eaten...just keep them! 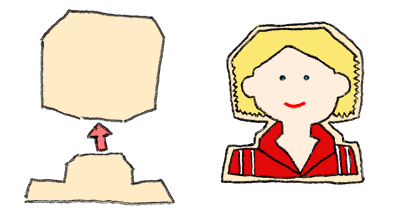 That is the most creative Gleekdom I have ever seen. You are so fantabulous and that's how I C it. Karine: That is very true. I mean in the show, they basically all wear the same uniform and all have a ponytail. dining room table & Amanda: Thanks! Lizzy: It was fun work though, hehe. Aww, cookies are meant to be eaten though, no matter how cool they look... or else they'll mold :O.
Laurelann: Thanks. Haha, love Sue! I saw these a little while ago but only just found your blog via flickr. Seriously brilliant work! Well done. These are ADORABLE! I knew who everyone was except for Terri (cause she hasn't been on the show in months so I forgot about her). Jimmy Trickle: Thank you. Welcome to the blog. Haha, Puck ;). Amberdawn: Thanks! Seriously, what happened to Terri? Characters just seem to disappear from the show. AMAZING... AWWWDORABLE... AWESOME.. and lots more.. love love loved them..